In appreciation to all the leaders of our district, please nominate Scouts and volunteers for the district awards in recognition for an outstanding Scout year. 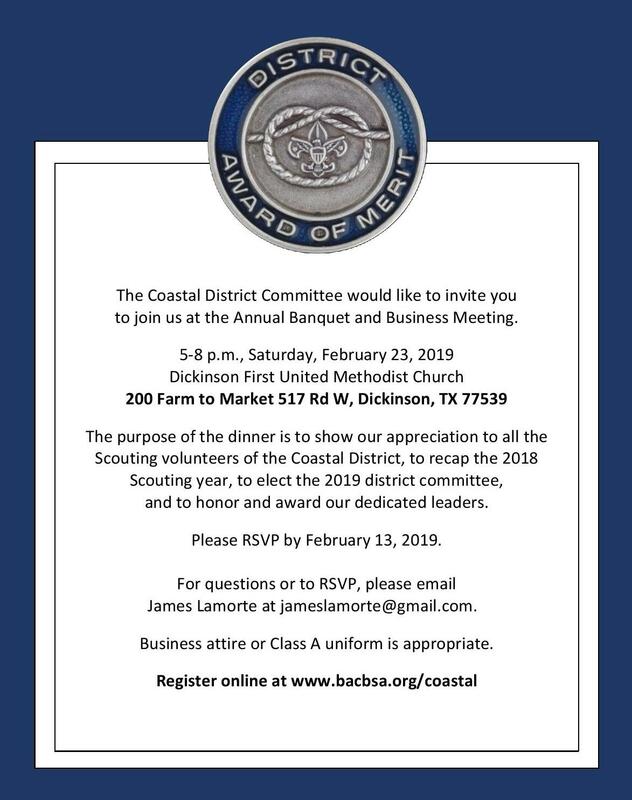 Please fill out the award forms below and submit them to your District Executive, bring them to your February Roundtable, or email them to James Lamorte at jameslamorte@gmail.com, mail them to the Bay Area Council, BSA at 3020 53 Street, Galveston, TX 77551. All nominees must be submitted by Feb, 6, 2019, 2018. ~ Lighthouse Award ~ This is for someone who volunteers at the District level, not just in a unit. ~ Be George ~ Nominate someone who is always willing to do the dirty work for District level events without having to hold title of "Chair" or holding formal leadership roles. All registered members are welcome to attend the District Annual Business Meeting with a special invitation to voting members of the District. Voting members include all duly elected District Members at Large, Chartered Organization Representatives, and Institutional Heads. We will meet to elect our 2019 district representatives and review our progress towards our strategic plan and complete other district business. If you would like to submit district business for review, please send a letter no later than February 6, 2019 via email to James Lamorte at jameslamorte@gmail.com or send it in writing to: Bay Area Council, 3020 53rd Street, Galveston, TX 77551. Thank you for your continued support of Scouting in Galveston Counties. Wear your Class A uniform or Sunday best!